The idea of the grammar school setup is to reduce the influence of judges who wince, smile or say "mmm" or "blecch" in their native language (can you say "yuck" in Finnish?) when tasting. Many studies show peer opinion is very powerful, even from an unknown person and even for those of us who think we always make up our own minds. When "eww" or "wow" comes from a winemaker or sommelier we respect, it's even harder to ignore. The OIV also eliminates the highest and lowest scores. My group had 7 judges, so only the middle five scores counted. I don't think this is a good idea for reasons both logistical and philosophical. First, seven judges is a lot of personnel to accommodate. Thessaloniki needed 28 judges to handle 600 wines in 3 days. With 5-judge panels, no scores eliminated, they would have only needed 20. That's a big savings -- nearly 30% -- on airfare, hotels and meals, at a time when the Greek economy is struggling. Other competitions, notoriously in Australia and New Zealand, would solve this problem by having tasters judge 125 wines a day: with 3-judge panels, 600 wines would have meant 9 judges, two days, finishing the second day at lunchtime. That's a lot cheaper for the organizers. But the OIV limits the number of wines a judge can taste in a day to 50, and this is a great idea. Lots of tasters brag about how they can go through 125 wines a day, no problem. No problem for them -- but for the wines? This is how wines of finesse get lost among blockbusters. My philosophical objection to the highest and lowest scores being eliminated only emerged after I saw how the system works. My panel tasted 150 wines and gave no score higher than 87. Think about that: our highest praise was the same score Robert Parker gives wines he hates. The competition solves that with a very generous cutoff for gold medals at 85 -- but the OIV has an answer for that also, as only 30% of the wines entered can receive medals. 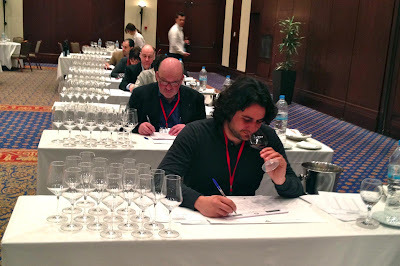 I like this rule; I judged at one competition where more than 80% of the wines got medals. It was like the Special Olympics. That said, I think our scores, as a group, were stingy for the good wines. Every judge I spoke to gave at least a few scores in the 90s, but collectively we couldn't muster much enthusiasm. Which means ultimately our scores looked like the product of a bunch of people stuck in desks, facing forward, working, no talking allowed. Maybe I should have passed a note reading ":)"
Special Olympics is a great way to describe that… I think it would also work in discussing the Jay Miller era at WA when he started spraying 90-95 points all around Spain, Mendoza and Australia and the meaning of the numbers began to seem quite a bit less meaningful. The school desk approach does seem a bit odd, but we have been arguing about the new influences of wine recently in the virtual world. Nice to be reminded that in the real world can be so subtle. Such a social vacuum for a such a social beverage is at odds. I personally enjoy talking about a wine out loud, thought that was a bit odd while taking Master Sommelier Exam. What, no winged-hat nun with hardwood ruler to rap you knuckles? Agree that a 7 person panel minus the hi & lo, net 5 testers, for frikkin wine, is a waste of $. Actually, the "proper" way is a bit more rigorous than that... sitting alone in a small booth with white partitions on three sides, wines passed to you through a sliding panel door by an anonymous staff person 6 at a time in glasses marked with a random 3-digit ID code, controlled lighting and temperature, etc. The logistics are hard to handle when the number of tasters and the number of wines to be tasted climbs above a certain number, though. Hence, the compromises adopted here. That is a funny setup for sure. 50 wines I could maybe do - with lots of breaks. 125 in a day, no way. For me, after 25 or so, they all begin to taste the same.